Have you seen the celebrities who have gone to bob hair Styles recently? There are so many that I’ve begun to think that bob hair styles are the must-have hair style. I’ve also seen drastic hair color changes on celebrities as well. Some celebs that have drastically changed their look include Salma Hayek and Nicole Richie. These two actresses are both new moms, which I think helps to explain why they chose the hairstyle changes that they did. 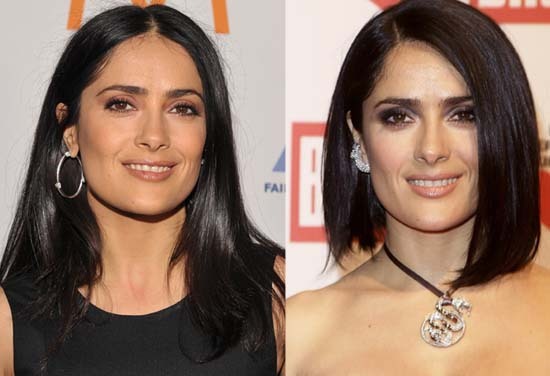 Salma Hayek is one celebrity to cut her long hair into a bob hair styles look lately. She debuted her new look last week at a charity gala. The hair style looks fabulous on her and I’m sure is a cinch to do too (which is helpful with a toddler running around). Rumor is that she cut her hair into this bob hair style look for charity. Salma Hayek proves that you can wear a version of the trendy bob hair style no matter what your hair texture is. Salma has very thick, coarse hair that she typically wears long. The length of her bob is perfect for thicker hair types because it allows easier styling than if the length was shorter. I’d suggest taking your bob hair style longer the thicker your hair is. From experience, it seems easier to style that way. If you have thick hair like hers, you can also request your hairdresser to texturize within the haircut to help the hair lay down nicely. Almost as shocking as Salma Hayek’s new bob hair style, is Nicole Richie’s new chestnut hair color. Nicole changed her new hair color to the launch of her House of Harlow 1960 Holiday Collection. Just like Salma, I think that Nicole chose this low-maintenance hair color for the ease of it. With two little ones under two years old, her own clothing and jewelry lines and more, she probably doesn’t have much time for a lot of other things, including high-maintenance hair. If you are looking to tone down your high-maintenance hair color like Nicole Richie did, you can but make sure you take these precautions. If you are going to color your hair within two shades of your current hue, then you may be able to do-it-yourself. If you are going darker, be sure to pick a shade that has red undertones so that your hair doesn’t turn too ashy. Coloring your hair darker than two shades beyond your current hair color? Then, let a professional hairdresser do the job and save yourself some very probable ‘bad hair days’ to come. December 18, 2012 By: Paul Lynn Leave your comments (0), Your input matters. Got Coarse Hair? This Bob Haircut is a Perfect Fit! New versions of the bob hairstyle just keep cropping up and one of the reasons is the incredible adaptability of the haircut. There is a bob haircut to fit any personality and hair type. For the woman with fairly dense, coarse hair, Debbie Lopez of Talking Heads in Newtown. PA, layers hair heavily to add movement to the ends and remove excess bulk. The shorter top sections curve forward and enhances volume at the sides. To boost movement even more, color or highlights can be added around the face. Color breaks up the surface and adds an extra added appeal! Your hair is medium to thick in volume, and medium to coarse in texture. Your hair is naturally straight or has a lot of body. Shampoo and condition from mid-shaft to the ends and towel-dry. Mist on a spray gel and distribute evenly. Begin blow-drying underlayers, directing them straight down, As you move up the head, wrap sections around your round brush and angle it slightly so pieces curve onto your face while also lifting roots on top. For extra volume, mist on finishing spray as you lift large sections and curve the front pieces inward. A trim every 6 to 8 weeks. Your hair is super-fine; it can’t stand up to this much layering. September 4, 2012 By: Barb Quinn Hairstyle Blog Leave your comments (1), Your input matters.